reflect on the factors that could exacerbate or alleviate one such situation. hostage situation, and safety of law enforcement personnel. school students to combat bullying. interviewing suspected victims, and resources available to seek support for victims. regulations related to the use of deadly force. such as in the Soldal v. Cook County, Illinois, case. laws to support analysis of the differences. changed due to the efforts of these organizations. presentation, citing landmark cases upholding these laws. training videos, role-play search and seizure procedures in a classroom/lab setting. disorders, and any other special population. 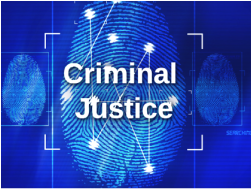 maintaining the constitutional rights of suspects and victims. classmates as if presenting to a jury. determining significance, and provide cautions and limitations when dealing with evidence. developments from the colonial period to today, citing specific textual evidence from research. requirements for staff (both pre-employment and professional development).